Spiegel online reported the imams belong to Ditib, an organisation controlled by Ankara that manages some 900 mosques or religious communities in Germany. German authorities on Wednesday raided the apartments of four Islamic clerics suspected of spying on opponents of the Turkish government, accusing them of hiding behind religion to conduct espionage on behalf of Ankara. 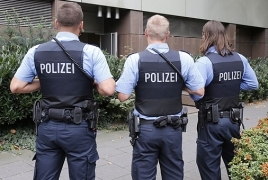 The federal prosecutors’ office said the morning raids in the states of North Rhine-Westphalia and Rheinland-Palatinate were carried out to collect evidence, and no arrests were made. The unidentified targets are suspected of spying on supporters of U.S.-based cleric Fethullah Gulen, who is accused by the Turkish government of orchestrating a July 15 coup. Prosecutors say the four men affiliated with the DITIB, the union of Turkish-Islamic cultural organizations in Germany, are suspected of passing the information on to the Turkish consulate in Cologne. DITIB had no comment when reached by telephone and did not immediately respond to an email query. Last week, when an official of Germany’s domestic intelligence agency said that 13 imams affiliated with DITIB had sent the names of alleged supporters of Gulen to the Turkish government’s Office for Religious Affairs, Diyanet, the union said it was not involved and that Diyanet supervised imams directly. Earlier this week, an Austrian lawmaker raised concerns that Turkish diplomatic offices around the world were gathering information to try to undermine organizations loyal to Gulen, who denies involvement in the coup. Austrian Greens Parliamentarian Peter Pilz said memos from the Turkish Embassy in Vienna and the Turkish Consulate in Salzburg showed ATIB, the Austrian equivalent to DITIB, sending in reports on Gulen-backed organizations, with the information then forwarded to Ankara. Pilz spoke of a “global spying network,” saying his team was working on publishing similar documents from 30 other countries in Europe, Africa and Asia. “If we have problems, for example with the Gulen movement, and Turkey has information about that, then our security authorities must discuss that with each other,” she said after meeting Prime Minister Binali Yildirim. Previous PostAll(-ah) your Caribic are belong to us!Next PostStop, for god’s sake stop, importing Muslims! These mosques are nothing but land grabs, operational centers for the muslim’s jihad by money, tongue, and violence. Islam is tolerated because of that religion facade. The infidels, in their wisdom and egalitarianism , have become fools.